PELCO® Cryo-Embedding Compound is a water soluble glycol medium for use in embedding for frozen sections. This low viscosity compound assures reliable freezing and smooth sections. PELCO® Cryo-Embedding Compound is a fully compatible, cost effective alternative to Product #27050, Tissue Tek® O.C.T. Compound. PolarStat Plus™ is an exceptional cryo embedding media that works well with an anti-roll plate or may be led off the blade with a brush. It is especially well-suited for Mohs cryostat sectioning. NEW! Now available in 4 optimal colors to accompany the traditional white formulation. This formulation freezes at -10°C. Optimal cutting temperature ranges from below-10°C to -40°C. Does not produce a powder residue while sectioning at -25°C or colder. Works with Auto Cryo Approach in Microm cryostats. No residue is left on slides during the staining procedure, thereby eliminating undesirable background staining. Embedding matrix for frozen sections. Less curling, less ice artifacts, freezes faster. 4 oz. per bottle, case/12 bottles. No residue or background staining. Freezes specimen matrix for cryostat sectioning at temperatures <10°C. Formulation of water soluble glycols and resins. No residue on slides during staining procedure. 4 oz. bottle. For Sale in U.S.A. Only. Golden Nylon Brushes, flat. Sizes 2, 4, 6 and 8. Ideal for handling and manipulating frozen sections in the cryostat. Overall length 17.5 to 18.9cm. Measurements taken just above ferrule. The brush handles may vary in color. Full Body Camel Hair Brush secured by a crimped metal ferrule. Ideal for cleaning cryostats and microtomes of debris and dust. Overall length 22.86cm (9"). Our new tissue marking dyes are formulated to provide very bright and clear identification of microscopic areas of interest and to easily identify the orientation of excised tissue samples. These dyes are readily visible on cut frozen tissue sections. These dyes will not run, bleed, fade or lose intensity from tissue processing and/or during staining procedures in the histology laboratory. Colors formulated to define margins without bleeding or fading. Durable, bright dyes hold permanently through processing and staining procedures. Unique lid design allows for complete removal or they may be conveniently flipped open with little risk of drying. Mohs surgery procedures to mark tissue specimens to map and identify the orientation and borders of tissue specimens. Pathology grossing of tissue to identify areas of interest and orientation of surgically excised tissue specimens. Identifying serial segments of large tissues to ensure proper orientation and embedding. May be used on fresh or fixed tissue. Note: Pretreatment of tissue to be dyed with #27208, ColorBond™ Mordant may greatly enhance the performance of tissue marking dyes, especially with fatty tissues. Holding Rack has two stadium rows for holding tissue dye bottles, holds up to seven 2 oz. bottles of marking dye. Top row has positions for 3 bottles of dye and a cylinder on each end for various applicators or tools. Lower row has positions for 4 bottles of dye and on each end a cylinder for holding more applicators and tools such as tweezers. A specially forumlated mordant solution that facilitates marking dye adherence to tissue and helps to prevent bleeding or fading of dyes. Particularly helpful with fatty tissue. Excellent for cooling liquid, semi-solid and solid specimens. Ideal for ultra-rapid freezing of fresh tissue, cooling of liquids to induce precipitation prior to filtering and cooling of field samples. PELCO Histo/Cyto-Freeze delivers instant flash freezing for cryostat sectioning. It cools down to -60°F (-50°C) in just three seconds. To cut frozen sections, mount sample directly on the microtome holder, simply spray to flash freeze and section. Time saving procedure and prevents water crystals built up caused by slower methods. The provided nozzle delivers the freezing action exactly where it is needed. Contains 10 oz. pure, 100% virgin tetrafluoroethane for enhanced freezing and cooling performance. Non-flammable, non-corrosive odorless gas. Ozone safe. Contains no CFC's. Does not contain dichlorodifluoromethane, cools to -65°C. Kit contains special low-temperature lubricants necessary for routine maintenance of cryostat microtomes. Includes Oil "A", Oil "B" and Grease "G". Adhesive pen for frozen sections. Will prevent sections from falling off or wrinkling. Effective with PAP/PAAP, ABC, LAB-SA and immunofluorescent methods. Stable up to 110°C. The new Tissue Capture Pen for use with frozen or paraffin sections. A coating of the glass slide will prevent the sections from falling off or wrinkling. Stable up to 110°C. Pen contains material for 3000-5000 applications. The CryoSette™ is designed for frozen tissue collection, transport and storage. It can also be used for storing a variety of other specimens in all laboratories. The robust design ensures that tissue morphology will be well preserved. The 2.5ml container features a wide-mouth opening and a high integrity screw closure. It is designed for a flat bottom and straight sides for easy tissue removal. The specific shape of the CryoSette™ allows its manipulation to be optimized, whether you are using gloves or not. The CryoSette™ efficiently stores tissue samples in -86°C ultra low freezers or in the gas phase of LN2 in Dewar flasks at -196°C, but not in LN2 liquid phase. The CryoSette™ screw closure and base are designed so they will not seize at low temperatures. Rapid visual 1-1/4 turn on/off. 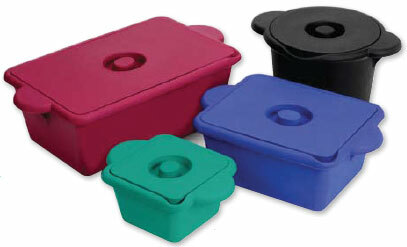 Color-coded inserts available in 5 colors. 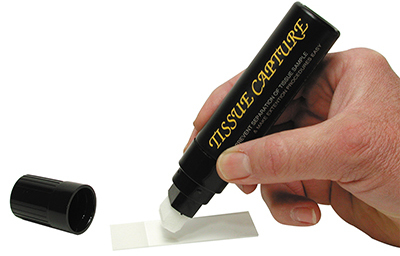 The CryoSette™ offers two surfaces for handwriting or applying identification labels: an interior surface and a larger space underneath the base. A thin Cardboard I.D. 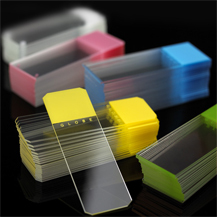 Label (product number 20955-10) and Plastic Transparent Cover (product number 20955-11) are available for the latter. The CryoSette™ is compatible with common tracking methods. The anterior writing surface is improved for ink adherence. Color Coded Identification Inserts (product numbers 20955-5 through 20955-9) are available in 5 colors: blue, red, green, yellow and lilac. 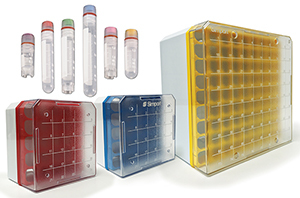 The Storage Rack is designed to contain 21 frozen tissue CryoSette™ Containers. The box is compact and has an SBS standard footprint to make suitable to several robotic storage systems. These innovative boxes can be stored in low-temperature freezers. Temperature range: -196°C to 110°C. Suitable for cryogenic storage, but only in LN2 vapor phase. The CryoSette™ CryoStore box can accommodate up to 40 CryoSette™ tissue containers in a space as small as 133 x 133 x 52mm H. Made of extra strong polycarbonate, the durable cryogenic storage box is designed to be used at temperatures between -196°C and +121°C and is autoclavable at 120°C, 15 psig (1 bar) for 20 minutes. Only use in LN2 vapor phase.